Carissas are tropical plants that like full to partial sun. It gets pretty jasmine-like white flowers with a strong pleasant smell despite the size of the flowers and plant. You can see these flowers on and off through out the year. Carissas also bare red plums that you can eat right off the bush or can make into jams and jellies. 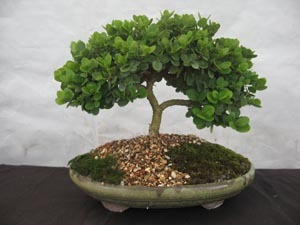 Can be grown as a nice fragrant container plant and is also a great bonsai subject.